Benedictions before and after meals. In the prayer-book of the Spanish Jews grace after meals is called "bendicion de la mesa" (benediction of the table); the German Jews speak of "benschen," a corruption of the Latin "benedictio." The duty of saying grace after the meal is derived from Deut. viii. 10: "And thou shalt eat and be sated and shalt bless the Lord thy God for the goodly land which he has given thee." Verse 8 of the same chapter says: "The land of wheat and barley, of the vine, the fig and the pomegranate, the land of the oil olive and of [date] syrup." Hence only bread made of wheat (which embraces spelt) or of barley (which for this purpose includes rye and oats) is deemed worthy of the blessing commanded in verse 10; bread made of rice, millet, or Indian corn is not included. Preparations of wheat or barley other than bread, and grapes, figs, pomegranates, olives, dates, wine, and oil do indeed come within the Scriptural command; but the grace after eating or drinking such articles is condensed into one benediction out of the three (or four) that are spoken after a meal which includes bread proper. When three or more men (a boy over thirteen is reckoned as a man) eat together, one of them, according to the Mishnah, says grace for all; in modern practise he only leads, the others joining. Two men of proper age and a boy old enough to have ideas about God are deemed by others sufficient; also two men who have had their meal and a third man who has eaten with them any food the size of an olive. The leader, after asking permission in the words "by permission [bi-reshut] of my masters" or "of my father and my masters" or "of the master of the house and my masters," opens thus: "Let us bless Him of whose bounty we have eaten." The others answer: "Blessed be He of whose bounty we have eaten and through whose goodness we live." The leader repeats this, and then proceeds with the benedictions. When ten are at the table the formula contains also the name of God, running thus: "Let us bless our God of," etc., and "Blessed be our God of," etc. A baraita (Ber. 45b; 'Ar. 3a) teaches that three women may in like manner choose a leader and have the like address and response among themselves; but this custom has fallen into disuse in modern times. When ten men meet at a wedding-meal they add after "our God" the words "in whose dwelling there is joy" (see Ber. vii. 1, 2, 3, and Gemara on same). The grace probably consisted originally of three benedictions: (1) The benediction closing "blessed," etc., "who feedest all," an acknowledgment of God as provider and sustainer of the world. It has no reference to Israel, to its history or Law, and it may be recited by men of any race or creed who believe in God. (2) The benediction closing "blessed be Thou, O Lord, for the land and for the food," and containing Deut. viii. 10. It opens with words of thanks for the heritage of the Holy Land, for the deliverance from Egypt, for the Covenant and the Law; lastly, for the food. Special thanks for the "miracles and salvation" that are remembered on Purim and Ḥanukkah are introduced here. (3) The benediction calling for God's mercy on Israel, on Jerusalem, on the kingdom of the house of David, and on the Temple; it proceeds with a request for plentiful and honorable maintenance, and lastly with one for the building of the Holy City, and closes: "Blessed be thou, O Lord, who in Thy mercy buildest Jerusalem. Amen." On the Sabbath a petition for rest undisturbed by sadness or sorrow is inserted; on festivals and new moons the same formula ("ya'aleh weyabo"), which on these days forms a part of the "'amidah" or prayer proper (see Shemoneh 'Esreh). These three benedictions are spoken of in the Talmud as of high antiquity. The words "who buildest Jerusalem" do not militate against this; they occur in the 147th Psalm. There is a fourth benediction of later origin and growth. According to a tradition, it was instituted after the massacre of the brave defenders of Bethar; when the Jews received permission to bury their bleaching bones, the fourth benediction, "who is good and doeth good," already in use upon the receipt of good news, was added to the grace, and was soon enlarged to a length equaling that of the three others, especially by a number of petitions beginning: "The Merciful" ( ). 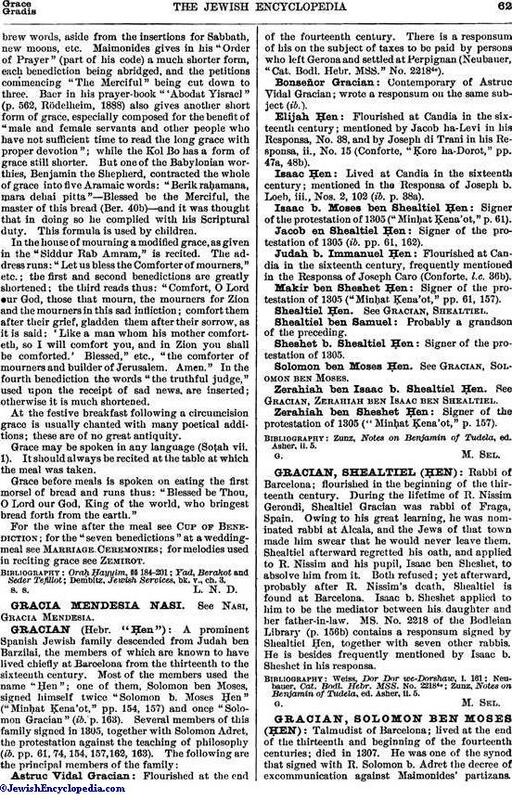 Grace as printed in prayer-books of either the German or Sephardic ritual runs up to over 350 Hebrewwords, aside from the insertions for Sabbath, new moons, etc. Maimonides gives in his "Order of Prayer" (part of his code) a much shorter form, each benediction being abridged, and the petitions commencing "The Merciful" being cut down to three. 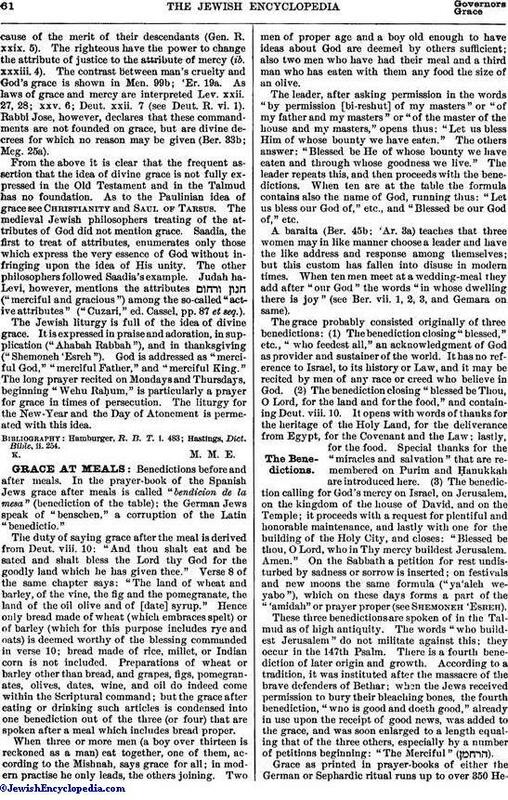 Baer in his prayer-book "'Abodat Yisrael" (p. 562, Rödelheim, 1888) also gives another short form of grace, especially composed for the benefit of "male and female servants and other people who have not sufficient time to read the long grace with proper devotion"; while the Kol Bo has a form of grace still shorter. But one of the Babylonian worthies, Benjamin the Shepherd, contracted the whole of grace into five Aramaic words: "Berik raḥamana, mara dehai pitta"—Blessed be the Merciful, the master of this bread (Ber. 40b)—and it was thought that in doing so he complied with his Scriptural duty. This formula is used by children. In the house of mourning a modified grace, as given in the "Siddur Rab Amram," is recited. The address runs: "Let us bless the Comforter of mourners," etc. ; the first and second benedictions are greatly shortened; the third reads thus: "Comfort, O Lord our God, those that mourn, the mourners for Zion and the mourners in this sad infliction; comfort them after their grief, gladden them after their sorrow, as it is said: 'Like a man whom his mother comforteth, so I will comfort you, and in Zion you shall be comforted.' Blessed," etc., "the comforter of mourners and builder of Jerusalem. Amen." In the fourth benediction the words "the truthful judge," used upon the receipt of sad news, are inserted; otherwise it is much shortened. At the festive breakfast following a circumcision grace is usually chanted with many poetical additions; these are of no great antiquity. Grace may be spoken in any language (Soṭah vii. 1). It should always be recited at the table at which the meal was taken. Grace before meals is spoken on eating the first morsel of bread and runs thus: "Blessed be Thou, O Lord our God, King of the world, who bringest bread forth from the earth." For the wine after the meal see Cup of Benediction; for the "seven benedictions" at a wedding-meal see Marriage Ceremonies; for melodies used in reciting grace see Zemirot. Dembitz, Jewish Services, bk. v., ch. 3.